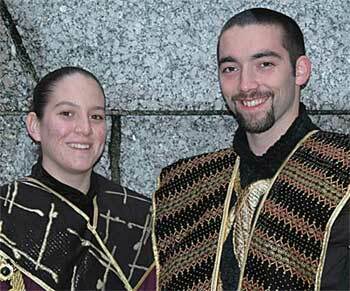 From the Mandarins Web site: The Sacramento Mandarins recently announced their drum majors for the upcoming 2005 season: Ben Duncan and Jessica McKinney. Duncan and McKinney will be leading the largest corps in Mandarins history, with more than 100 members. The corps will have a full schedule of West Coast shows and will be traveling on a three-week national tour, starting with the DCI Southwestern show in San Antonio, Texas. Ben Duncan is returning for his third year as a drum major. During the previous two seasons, Ben demonstrated outstanding conducting and leadership skills in leading the Mandarins both on and off the field. Ben is presently studying to become a music educator and is an instructor and visual designer for McClatchy High School Marching Band and Color Guard in Sacramento. Other interests include playing saxophone and coaching track. This is Ben's ageout year. Jessica McKinney is a senior at John F. Kennedy High School in Sacramento, Calif., and will be attending the University of the Pacific next fall. This is Jessica's first year as drum major, having marched the previous two seasons as a member of the Mandarins' baritone line, where she was noted for her many positive contributions to the organization. Jessica is an accomplished tenor saxophone player and is the lead and solo tenor saxophone player in her school's jazz band. In addition to drum corps and band, Jessica is working 25 hours a week also a courtesy clerk and maintains a 3.63 grade point average. For membership and program information, go to mandarins.org.